St. Patrick’s Day on the weekend for a change is a rare chance to do something exciting for the holiday without the constraints of a workday. So can you guess what I did today? I ran a race, of course! Big surprise, I know. 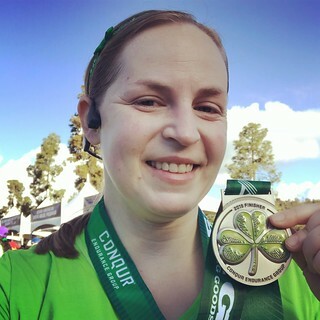 The Big LA 5K at Dodger Stadium this morning was delightfully St. Patrick’s Day themed with green shirts, green race bibs, and a medal with a shamrock on one side. It was fantastically festive. And I got to wear one of my holiday-specific running shirts for the occasion. It proclaimed my heritage as “Irish Every Day.” Very accurate. Even the weather cooperated (winter finally arrived in Southern California this month and it’s been gorgeous). Everything was great, except for the course. There are some serious hills around Dodger Stadium and they make for less than pleasant running. I’m still getting back in shape after a few months of inactivity so it wasn’t an easy 3.1 miles for my weak body, but I’m so glad that I went out and did it. The LA Big 5K is also the last race in the Triple 5K Tour of LA Challenge (Santa Monica, Pasadena, and Los Angeles) so I got an extra medal at the finish line. That’s always good motivation to get up before the crack of dawn, drive an hour, and hit the course even when I don’t want to! Let’s hope this marks my return to regular running again. 2018 has been rocky so far, but I think it’s looking up. Happy St. Patrick’s Day everyone!